I probably shouldn’t admit this but I am a gold medal grudge holder. They run long and deep with me. Cross me once and you won’t often get a chance to do so again. Think excommunication or shunning is extreme? That’s ok, we can agree to disagree. The funny thing is that I hold grudges with food as readily as I do with people. Maybe more so. Tacos? I’ve never forgiven you for making me violently ill when I was 12. That was 27 years ago and I haven’t had another one since. The fact that antibiotics were involved is irrelevant to me. Liver and onions? Like religion, you were forced down my throat and I’ve lost all taste for you. Barbecue and I have recently reconciled after a lengthy estrangement. I’ve got The Mistah to thank for reuniting us and my life is better now that I’ve let go of those hard feelings. Which brings me to beets. As sure as the sun would rise in the east and set in the west, there was always a jar of pickled beets on the kitchen table for my Grandfather. They were HIS property, his private domain. Which was fine with me because they were, in a single unsophisticated word, yuck. Everything about them repulsed me. The way they bled freakishly crimson. The way the scent of vinegar assaulted me every time that jar was opened. 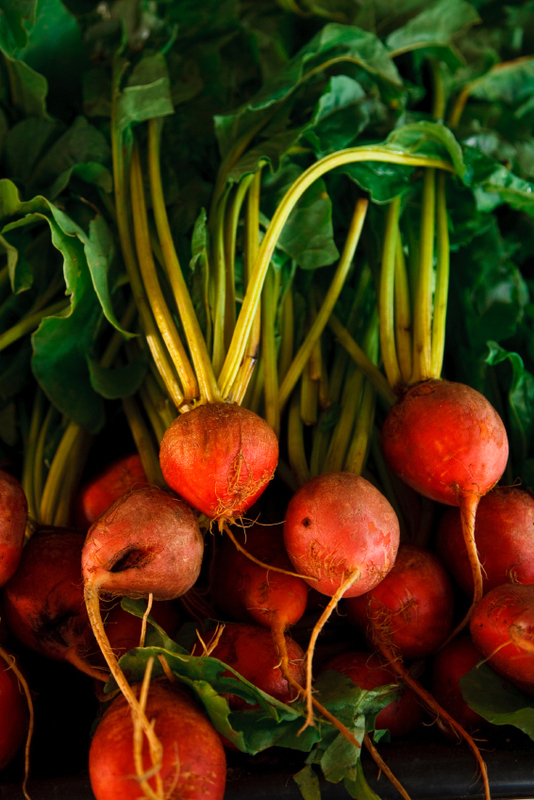 Everything about them told me that my life was better off without beets. Flashforward 30 years. I’m at a dinner party. The host has prepared beets. Do I pretend they don’t exist or do I put on my best guest manners and take the smallest of portions, force a smile, and choke it down? Every fiber of my being said to ignore the beets but I know how I feel when people ignore my food…I take it personally. So I sucked it up and put one of the beasts on my plate, determined to be a good guest. My fork danced around the plate to the pork, the mixed greens, and the asparagus. It instinctively avoided the beets. When I could delay the inevitable no longer, I took the most tentative of bites. And despite looking like those pickled beasts of my memories, the beets were earthy but sweet, tender but still firm, and absolutely refreshing. I promptly went back for more, surprised at how much I was enjoying this root vegetable that had inspired my longest running grudge to date. Since that epiphany, I’ve made beets for The Mistah. My first attempt involved steaming them. Let’s just say that I took my eyes off the pot long enough for all the water to boil out. The smell of scorched beet sugars was almost enough for me to reinstate my anti-beet stance. And then I happened to see Anne Burrell roast hers in the oven. No olive oil. No salt. Just whole scrubbed beats and a hot oven. So I gave it a try. I’m not sure what kind of turbo action Anne has on her oven because after 45 minutes, I could not easily slide a fork or knife into the beets. That magic took about another hour and a half. But once they were cool enough to be skinned, sliced, and introduced to some soft goat cheese and the merest whisper of balsamic vinegar, they were worth the wait. Even when you figure that the wait was actually 15,768,000 minutes for the 30 years it took me to get over this grudge. BAH Note: I prefer to work with golden beets since they don’t stain like the red ones do. You use what you like best. This is more a process than a “recipe”. I enjoy eating these by themselves but this would be a great addition to mixed greens for a quick salad. Heat oven to 400 degrees. Scrub the beets and trim any greens down to about 1/4 inch. Wrap the beets in aluminum foil and roast until a fork or the tip of a paring knife easily slides into the beets. This could take 45 minutes, it could take 2 1/2 hours. Start checking after 45 minutes and then every 20 to 30 minutes after that. Allow to cool, peel off the skins, and slice the beets. Garnish with crumbled chevre and balsamic vinegar to taste. Any and everything with chevre is worth waiting for even beets that are NOT pickled. I remember my friend from home having a similar taco experience at our house once. she was so embarrassed and I was so upset that we made her sick! Emily, I brought some of the beets with my lunch today. Sadly, the chevre and balsamic are at home. Tacos? You’re dead to me. sounds wonderful Wendi! Any idea of a taste difference between red and golden beets, I have had both, but combined in a salad, so I can’t say whether they were different other than color? Joanne, my completely biased opinion is that golden beets have a milder flavor than red beets. Of course, that could be my old prejudices against the red beets talking. Since giving beets another try, I’ve mostly made golden beets. Roasted, they are earthy with a hint of sweetness. And sliced wafer thin, they crisp up into beet chips in a super hot oven! I agree that the yellow beets are milder. It took me forever to get over my fear of beets, but now I love them! Beth, I think I might have overdone it with the beets this last weekend. I bought three bunches to make chips. But that only used about half of them. So then I had to roast off the other half. I feel like I’ve got beets coming out of my ears! i chanced upon your blog while reading shutterboos. glad to find one who love cooking and photography! Hi bibimoon, thanks for clicking over from Shutterboo. Isn’t she fabulous? Hope you are having fun getting to know your Canon. Your three dimensional cards are incredible. I don’t have the patience for that kind of project. I can honestly say I’ve never eaten a beet. I don’t ever remember having them around the dinner table. Could it be regional? Or is my family just not beet-eaters? Boo, I don’t know that beets are a regional thing. I think it’s more that many people are not beet eaters. They can be pretty intimidating. And polarizing. But if you like other root vegetables, I highly recommend you pick up a bunch of golden beets and roast them up. Use it as excuse to buy some chevre and balsamic. Yeah beets can definitely be a scary looking food, but I am with Anne Burrell on this one, roasting is the way to go! And with the vinegar and cheese? Heaven! And speaking of a.b., I really like listening to her on her show, she has a very natural way of speaking to her audience and getting us excited about what she’s making. Hi Elizabeth. How’s the move going? Seriously, Anne must have a turbo convection oven or something because my beets weren’t anywhere close to done after 45 minutes when I didn’t put them in the foil packet. I do like Anne but sometimes I just can’t listen to her talk. I think it’s the baby voice she uses sometimes. Just freaks me out. Tes, if you are already a fan of the beet then I think you’ll like them roasted. Root veggies??? ?turnips OK, rutabagas…..steeped ins simple syrup and golden yellow..YUMMY,NO FREAKIN’PARSNIPS!!!! !1 tasted like kerosene smells! UGH! I don’t do beets, either. Nasty. But pickled might be okay–I love me some brine. Wendi, your writing is terrific on this one! Kitch, it’s funny but my love of pickled, brined things stops at beets. And I’m ok with that. Thanks for the kind words. Can’t wait to read about the Food and Light workshop.